Know what I hate? I hate when I’m watching a movie or a show and someone jumps out of a car or runs out of a house and leaves the door wide open. I will sit there and obsess over that open door for ages. Seriously, it bugs me! How hard is it to write into the script “shut door”. That’s what we do in real life. We shut doors! And if there’s a clock in the background? Forget it! I can’t stop looking at it and wondering whether the time was set to that particular hour for a reason? Does the clock even work? It drives me nuts! Yes, devil is in the details isn’t it? My daughter was watching Caillou today. I’m not a big fan of Caillou. But what I get hung up on every time the show comes on is his head. He’s a 4-year-old boy, yet he has no hair? His two-year old sister has a full head of red hair, yet Caillou hasn’t one little wisp. What’s that all about? I find myself obsessing over his head every time. It really gets to me. Clearly I have a habit of over thinking things. My 4 year old doesn’t care whether Caillou has a thick head of hair or not so why should I? I might come off as a detail oriented person, but I’m not. I wish I were. If I really did focus on the details all the time, then my Greek hand pies might be perfect crescents with edges perfectly pressed. But that’s the beauty of hand pies isn’t it? They are meant to be imperfect as they are formed by your hands! These might look a little amorphous, but they taste sublime! 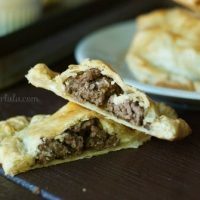 I used a pre made crust to keep it quick and simple then filled the crust with ground beef that was infused with Greek seasoning. 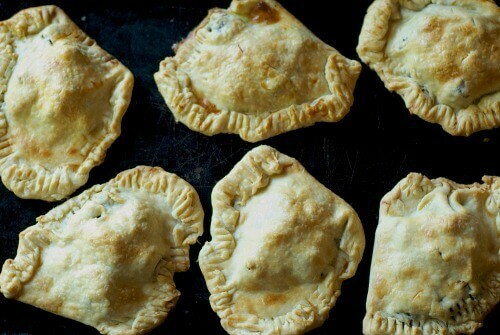 You must serve these hand pies with a tzatziki dipping sauce! 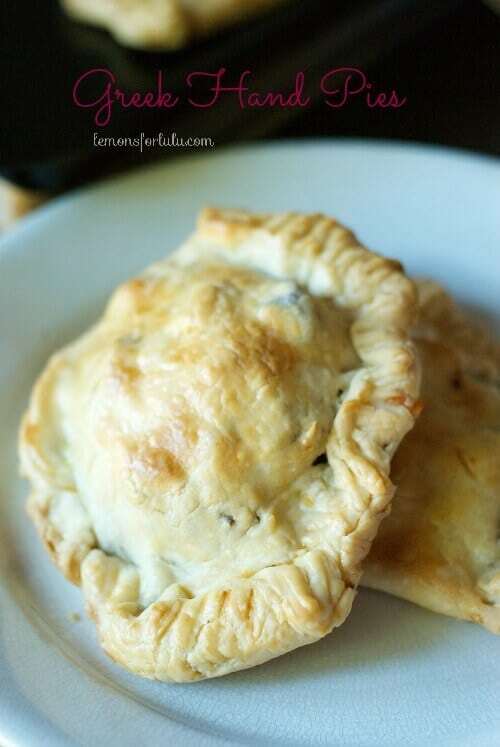 It’s smooth, creamy and cool; the perfect accompaniment to these savory pies! After these hand pies made their debut at the dinner table, the only detail I could focus on was the crumbs on the empty plates! 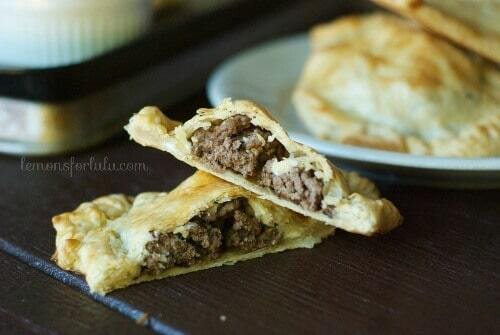 A savory hand pie that starts with a pre-made crust and is stuffed with pungent Greek flavor! 1 egg lightly beaten with a splash of water. 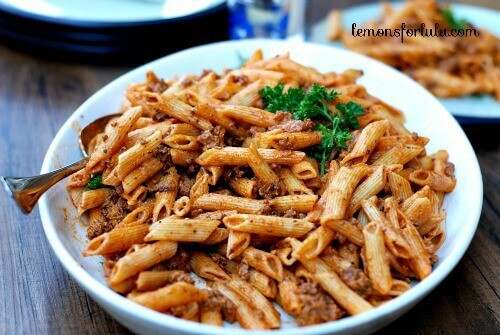 In a large skillet, brown ground beef stir in garlic and Greek seasoning and salt. Add zucchini and olives and continue cooking until zucchini just starts to soften. Remove from heat. Roll out each piecrust and cut in half. Spoon a generous amount of filing onto one half of each pie crust half. Top with about a tablespoon of feta cheese. Fold dough over filling and crimp edges with a fork or pinch with your fingers. Place on a baking sheet. Continue with the rest of the pie dough and filling. Brush each pie with egg wash.
Bake for 20 minutes or until golden brown. Remove. Serve with Tzatziki sauce. Combine all the ingredients in a bowl. Season with salt and pepper to taste. 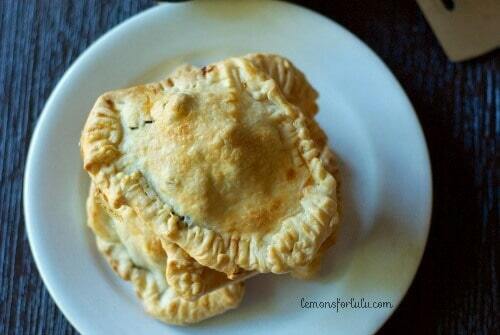 These hand pies look great! I need to give them a try! Haha details are killing ya! I would never notice that stuff…too funny! These sound amazing! Thanks Julie! Maybe I’m just weird. Thank you Jamie, these were a hit with the family! Me too Nicole! So easy too! OMG. I am always going to notice that now about movies. haha. too funny. These pies look awesome. I love greek food. Pinned!!! I freaking love these hand pies. Totally brilliant. Makes me wish I could find lamb somewhere. 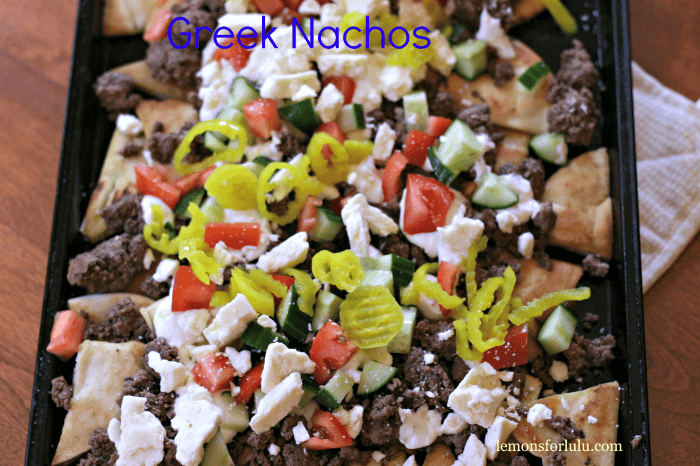 But ground beef and oregano and TZATZIKI !!!! will do the trick! Hand pies are the best! Those look so tasty – my guys are gonna like these. Thanks for the recipe. Thanks for stopping by Debra! It’s a terrible habit Lisa, I have to just focus on the story line and not the details! Thanks Lisa! These look wonderful! Thanks for sharing this one. Tanya, I’ve never made anything like this and they sound absolutely delicious! Thank you so much for sharing your recipe and I really want to try these! Pinning! Hope you have a wonderful Monday! Your are so sweet Cindy! Thank you! You have been on my to-bake bookmark list on my phone for some time now, finally had some time today to make these!! What did you think? I love when I can simplify a Greek dish. Oh, funny stuff on your page. I am not Greek but I had many friends in Fresno High School who were first generation kids from Greek families. I dearly love the food, am making some tonight for my confused husband. Are you acquainted with Kopi Sotiropulous oh I hope I spelled it right, but he is a newscaster in Fresno where we were in high school together. If you don’t know him find him on Facebook and I will give you an OK. You can find me on FB and Kopi is a friend on my page. Could these be frozen? To have later would I make them and not bake them? Or bake them and then reheat them? I am a “double the batch” when I can for quick lunches and light dinners. They sound fabulous. I would bake them first, then reheat as needed.